Over the past week, Facebook, blogs and the twittesphere have all been buzzing about Invisible Children’s new viral video campaign, Kony 2012. The Invisible Children non-profit began with a simple, but difficult concept — make people care about Joseph Kony, the Ugandan warlord who routinely kidnaps and uses child soldiers to maintain his power. The organization’s campaign goal was clear: make Kony famous (or rather, infamous) by creating a video so compelling, that hundreds of thousands of people would join the cause. One week and 70 million views later on their 30 minute video detailing Kony’s regime, Invisible Children by all means achieved their goal. To put this feat into perspective, the Old Spice Guy took 5 months to reach the same level of YouTube views. So, who are these new found supports? We dove into our Facebook campaign data to find out. Not surprisingly given the campaigns’ focus on lobbying to the United States government, Invisible Children has the most reach in the US by a very wide margin — over twenty times the reach of Canada. 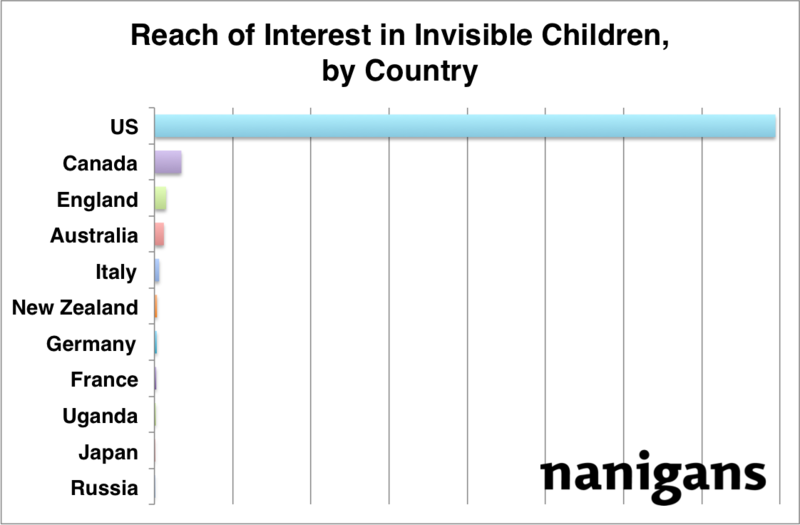 Other English speaking countries, Canada, England and Australia, trail next as being the countries with the most Invisible Children buzz on Facebook. And while the campaign has garnered some reach with members of the G8, the reach is fairly insignificant when compared to the United States. Breaking down the reach within the United States by age, it is pretty clear that young people aged 13 – 20 are the primary driving force of the buzz on Facebook. This reach is followed by 21 – 30 year olds, and declines significantly in older generations. 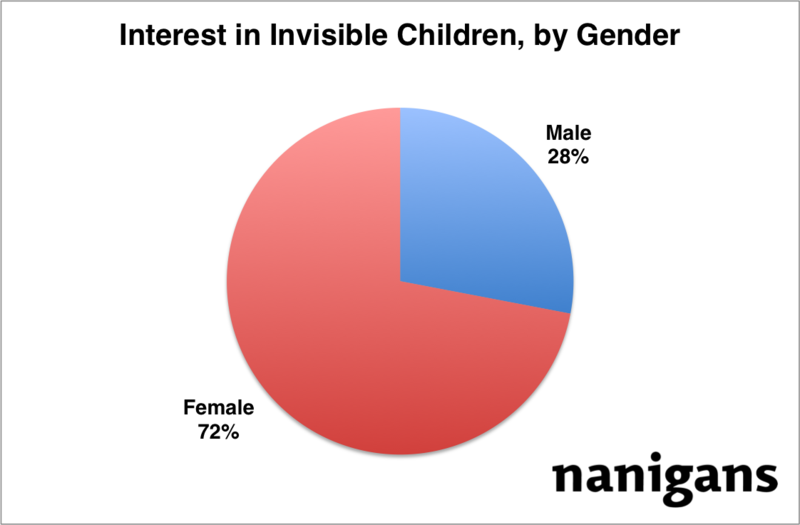 Next, we dove into the gender composition of people interested in Invisible Children on Facebook. 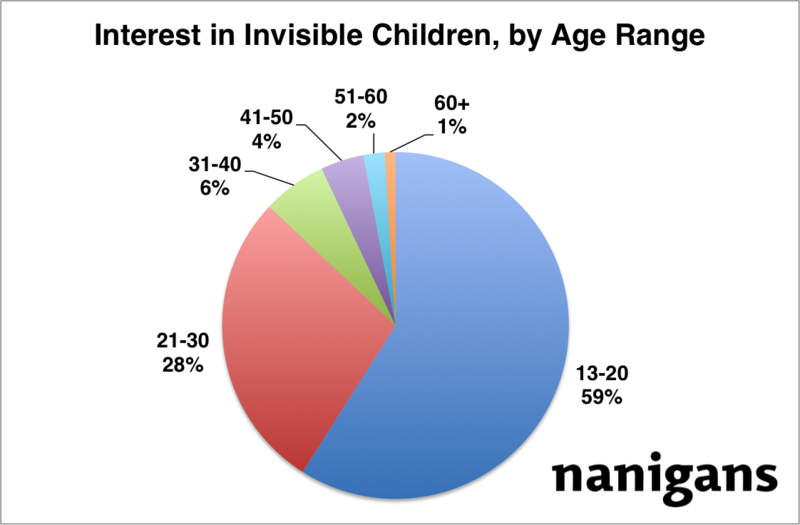 Judging by the graph below, it is clear that more women on Facebook are supporting Invisible Children than men.